PLaying with the certificate store, thumbprints did not do anything. So I tried it on another dev machine and the event log showed a different error! Changing the server in the FTP adapter to the DNS name in the certificate did the trick! Without thumbprint the certificate is correct resolved. So when you encounter certificate error also you can check this. I was working for a customer and there was a need for receiving files via HTTP and saving them to disk. A BizTalk receive location was enabled on that location and processed the file after it was stored. Normally you would make use of BTSHTTPReceive.dll and directly send it to a BizTalk location. In this case the client wanted a buffer location for the files. Now you can you the https settings in IIS to encrypt the transfer and disable anonymous settings so posting is only allowed with username and password. Enjoy the script, let me know if it works! Hi, I was debugging some project and got this error while executing. I added the connectiong string in the machine.config and still getting this error….. The fix was restarting Visual Studio….. Somehow it is cached in vs.. 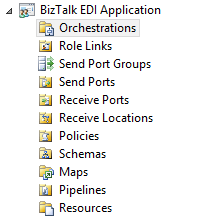 When you are using the EDI batching functionality for outgoing messages in the BizTalk platform, it can be an effort to start all the batching for an environment. You will run this on the management database of BizTalk, and all your batching will be started. Good luck!